Elounda Solfez VillasWelcome to Elounda! 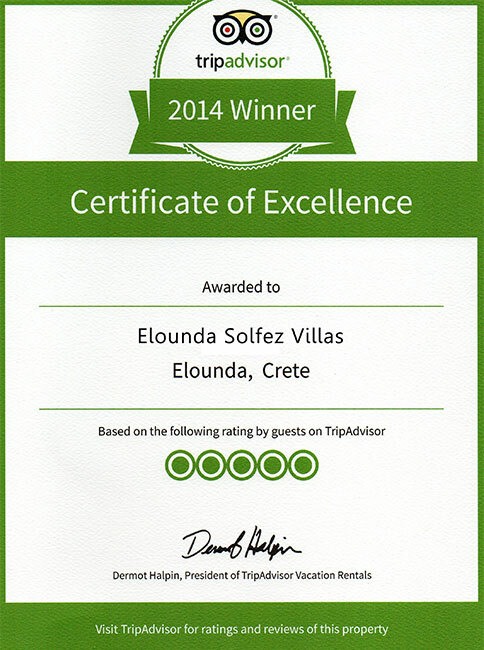 Elounda Solfez Villas are self catering vacation rentals, located in Elounda, in Eastern Crete, Greece. Arranged on a hill, as on a music pentagram, they offer mesmerizing views over Elounda, Mirabello Bay and the Sea of Crete. At day break the sunlight beams will gently caress you out of Morpheus (God of Sleep) Land and lead you for a refreshing swim in the privacy of your pool, before enjoying your breakfast with natural Cretan Diet products and be filled with energy for the rest of your day. Elounda’s name, stems from the ancient Olous, to become Olounda and finally nowadays Elounda. Elounda is a slow paced, picturesque, fishing village, blending ancient memories with contemporary living and mouth watering Cretan gastronomy with crystal clear secluded beaches and warm hearted local people.